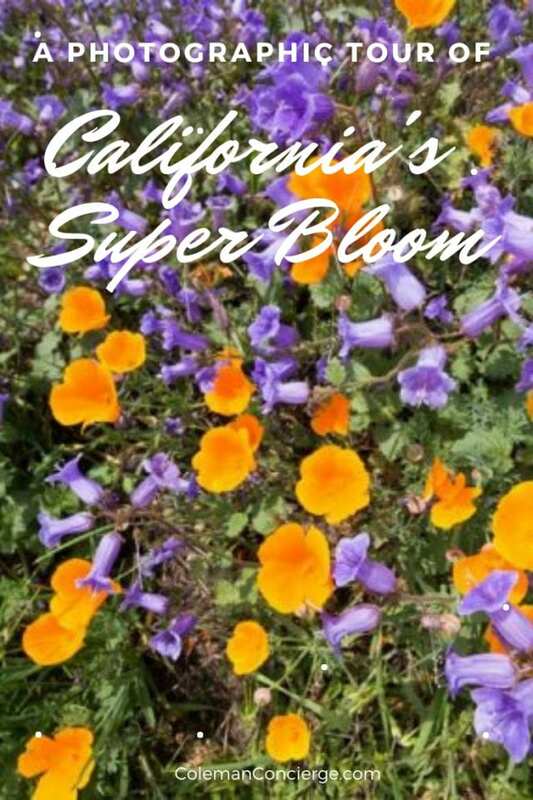 This year is shaping up to be another Super Bloom Year! 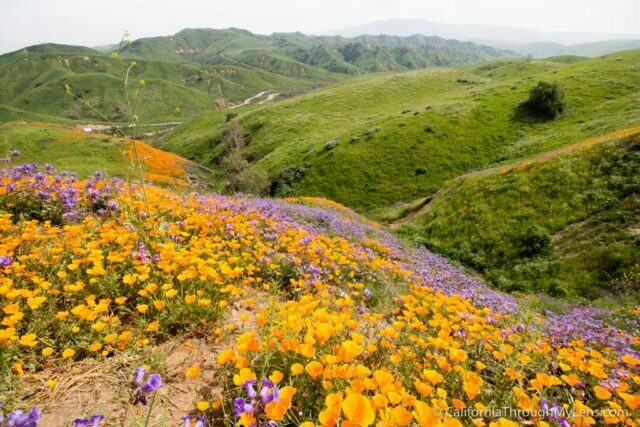 In an unusual turn of climate events, California is seeing it’s second super bloom in two years. 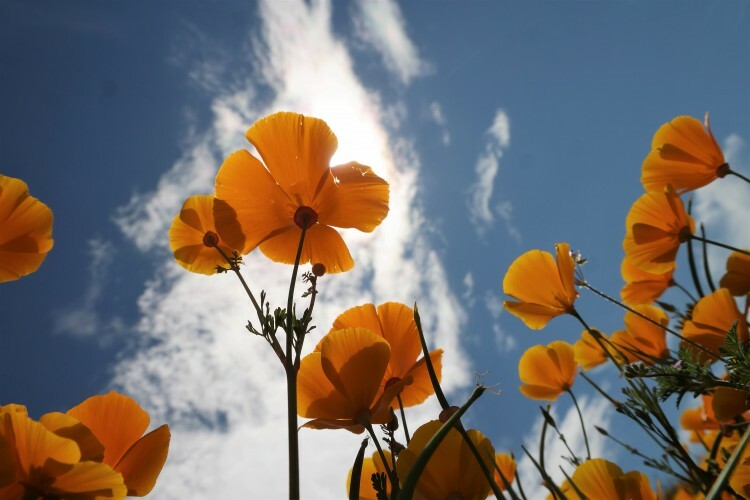 Typically super blooms happen about once every ten years, but prior to 2017, they were occurring less frequently because of the drought. 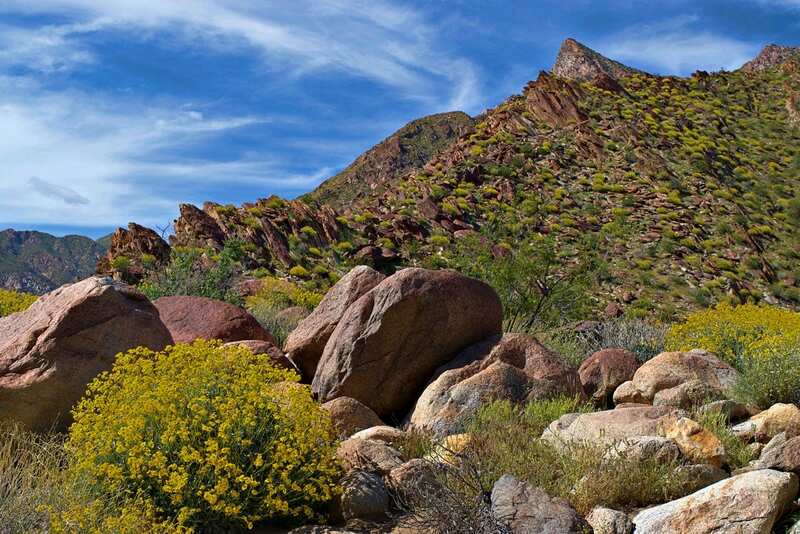 For dozens of years during the drought, the thirsty deserts waited for rain. As the drought continued to set in, fires ravaged the parched forests. 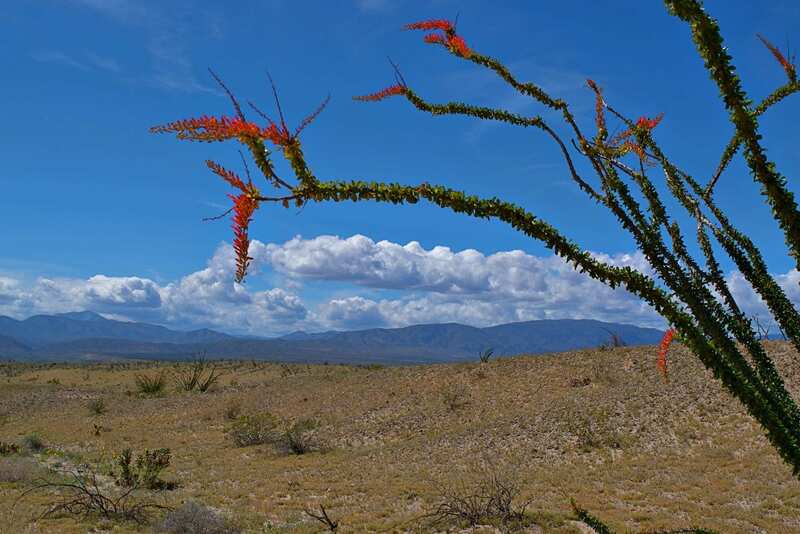 The desert waited for the pernicious El Nino weather patterns to shift back. Only through recent climatology study, have we seen the profound effect of El Nino droughts. 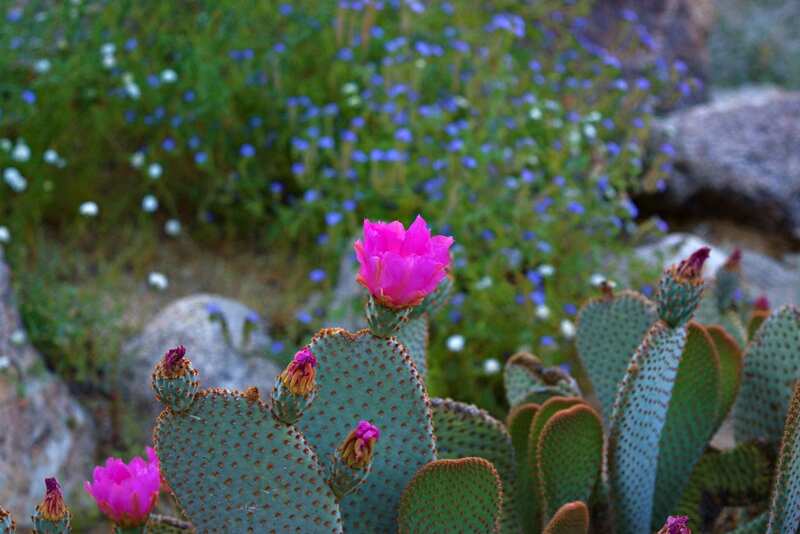 In California, it was visible in dry, parched earth. When the rains finally came in, it was the bloom of the decade, and now the second bloom of a decade! 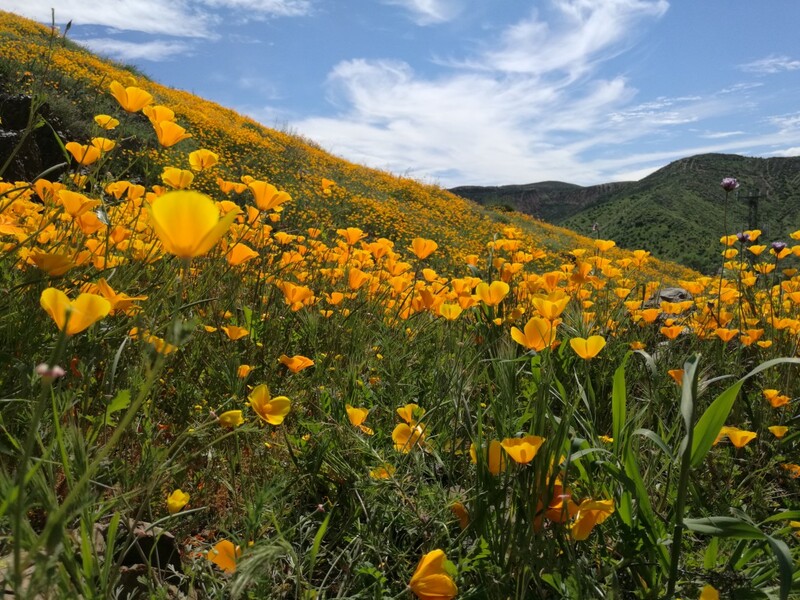 As the blooms erupt, amateur and professional photographers have once more taken to the hills to capture the cavalcade of color. We did our part too, but the more pictures we took, the more we realized the extent of what we were witnessing. A single lens couldn’t capture the bloom of the decade. 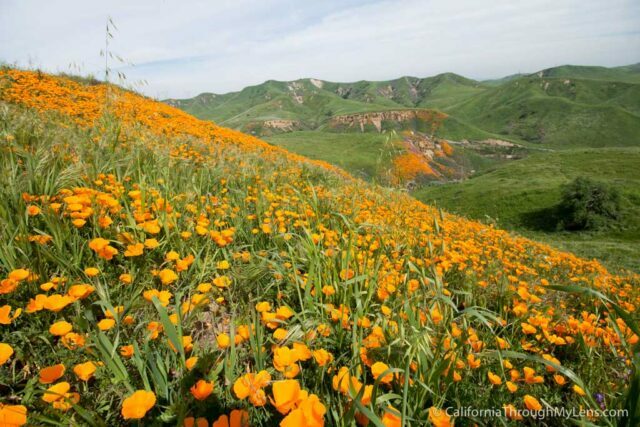 Instead, we are providing our pictures from California’s epic wildflower seasons along with highlights from some of our favorites photographers. Without further ado, here are the images sorted by location with an interactive map at the end. 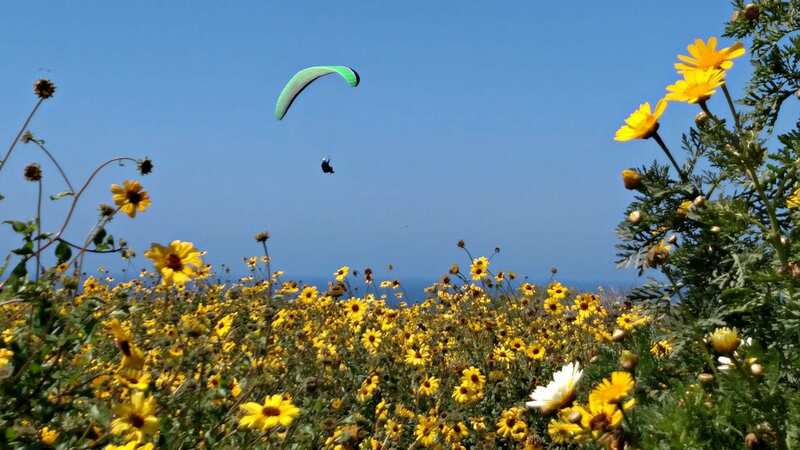 Long considered a photographic hotspot, this year the flowers add something extra to the sweeping panoramic shots of hang gliders with the backdrop of La Jolla behind them. 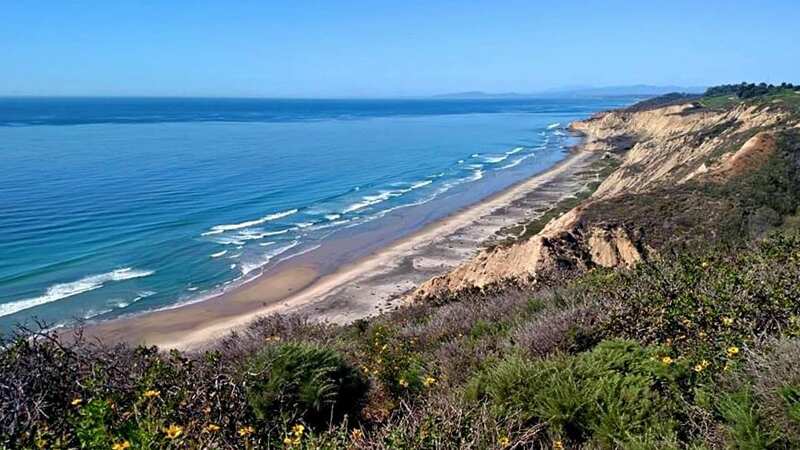 Do you know what else is special about the Torrey Pines Gliderport? It’s free and easy to park here. If you’re near UC San Diego with your camera, you should stop by and see if there is a scene worth shooting. 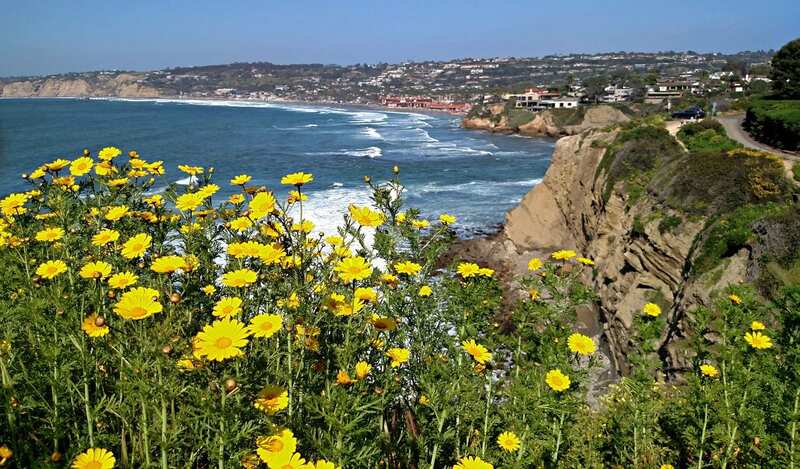 The Coast Walk is a short 1-mile trail that connects La Jolla Shores with La Jolla Cove but best of all, it’s all oceanfront hiking. 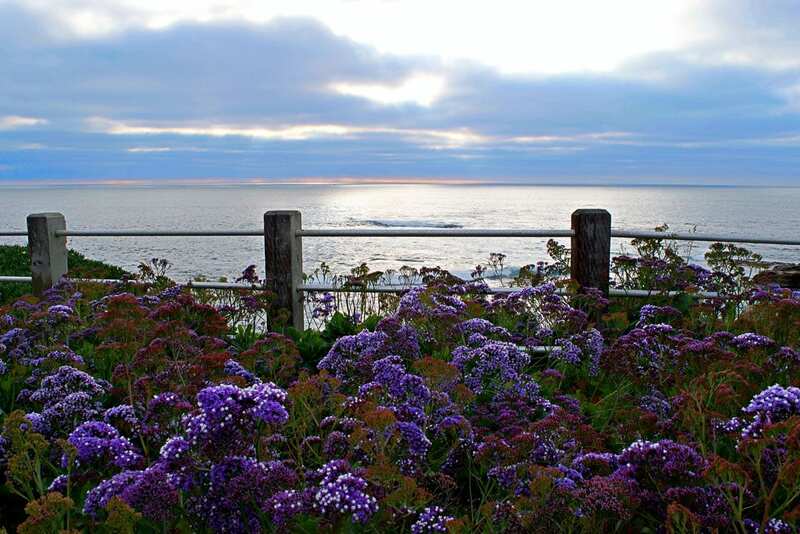 The epic bloom adds that extra je nes sais quoi to the blue backdrop of La Jolla Shores. 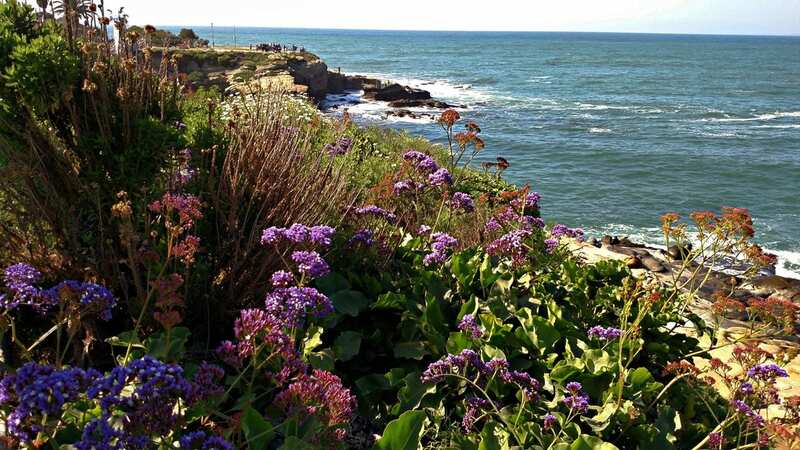 There’s a small 2-hour lot on the La Jolla Shores side of the coast walk that’s sometimes easier to park in than the Cove. 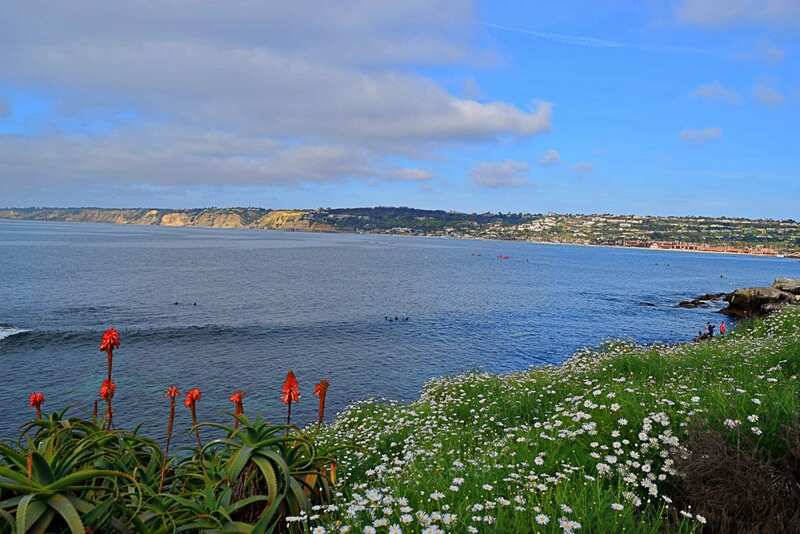 The good thing about La Jolla Cove is that there is plenty to see, so it’s worth the effort to park. Mile for mile, this is the most beautiful trail in San Diego. 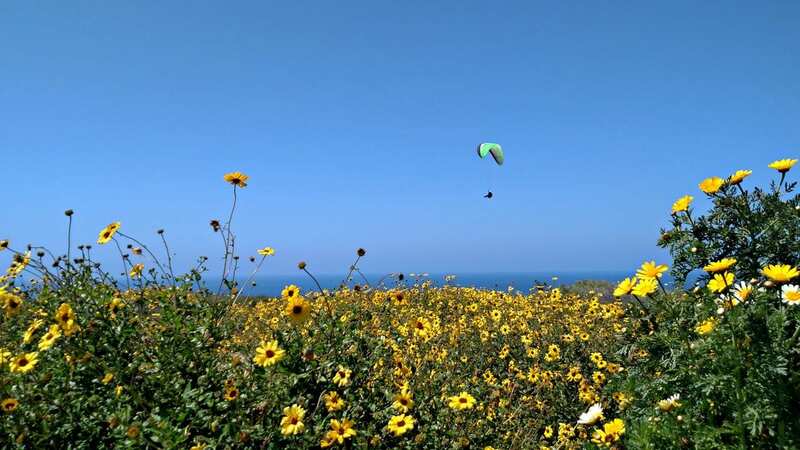 Scripps Park is the quintessential California coastal park. 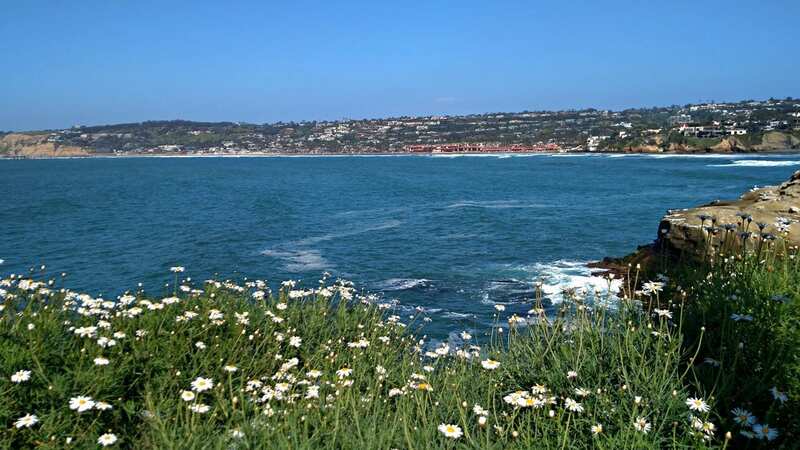 It sits on a rocky point that runs about a mile from La Jolla Cove in the north to the La Jolla Tide Pools at Hospital Point on the South. 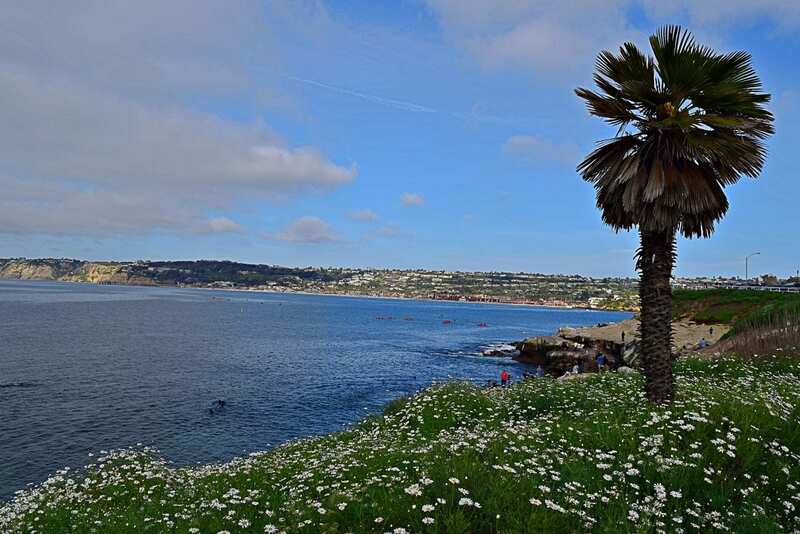 La Jolla Cove is home to baby sea lions, and nesting cormorants and brown pelicans. Around the corner from the cove sits Boomers where the high spring tides send waves crashing in an explosion of water and mist. Next is the sheltered cove of the Children’s Pool where you’ll find baby harbor seals. Finally, you reach the La Jolla tide pools. During low spring tides, these pools drain and capture sea life that you’d usually have to snorkel to see. 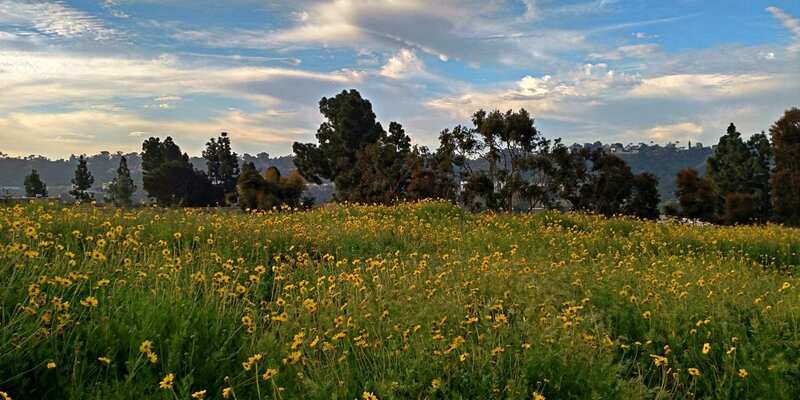 Ellen Browning Scripps Park connects these beautiful views with fields of flowers. 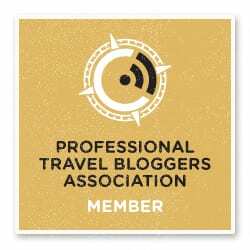 Of course, while you’re there, don’t forget to stop for gelato. 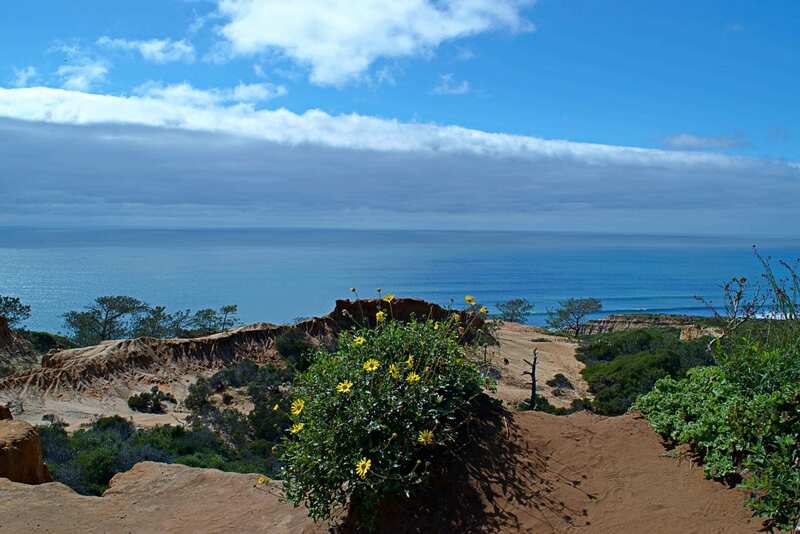 Mt Soledad sits high above the La Jolla coast offering unparalleled views and panoramic photo ops. Ok, not that high at 823′ but your lens can still catch amazing shots. 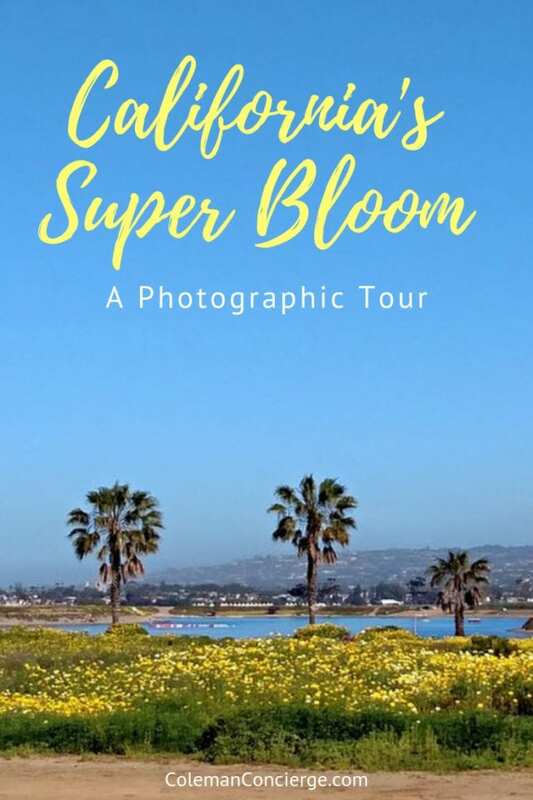 What’s more, with its proximity to San Diego and free and easy parking it’s a great place to go if the sky looks amazing and a must visit for out of town photo buffs. 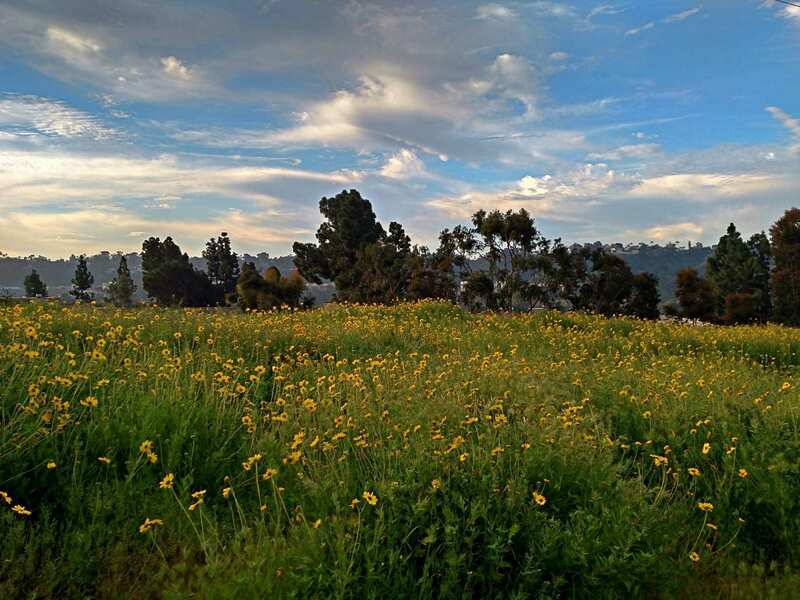 Our friend Evgeny Yorobe captured this unique view of wildflowers from Mt Soledad with the marine layer at sunset. 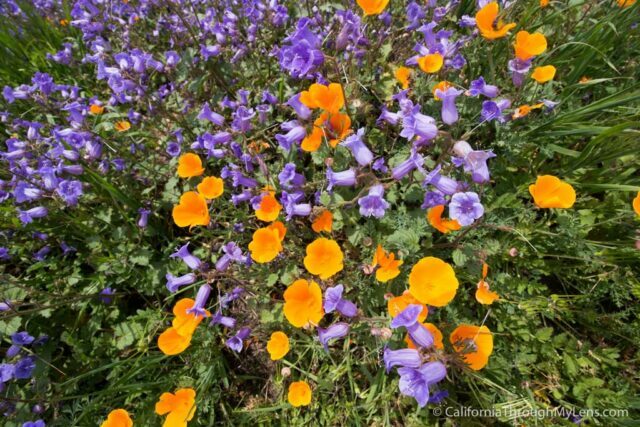 We love how he captures light in his work, which plays so well with the super bloom. 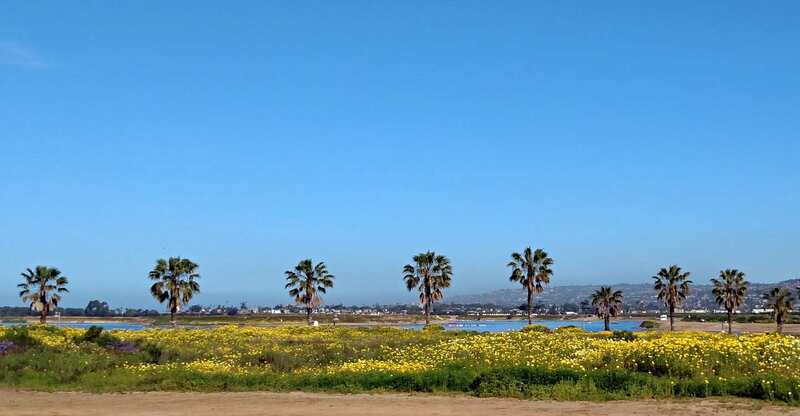 The San Diego River connects the mountains of Julian with the Pacific Ocean between Pacific Beach and Ocean Beach. 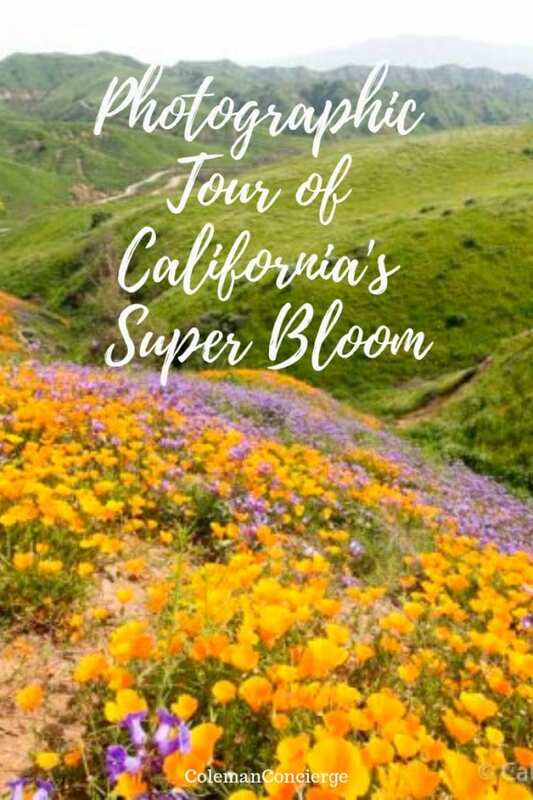 There are many beautiful spots along this waterway, but we choose two for the spring super bloom. The first is at the mouth of the river as it empties into the ocean. This is located within the Mission Bay Park system. The second is along the San Diego River Bike Path that heads up the river. It’s along Via Las Cumbres as it climbed out of the valley. I am sure there are plenty of beautiful scenes like this in every side canyon and field along the river this year. 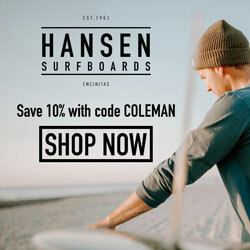 If you’re down this way, check out our Ocean Beach Guide for more fun spots. 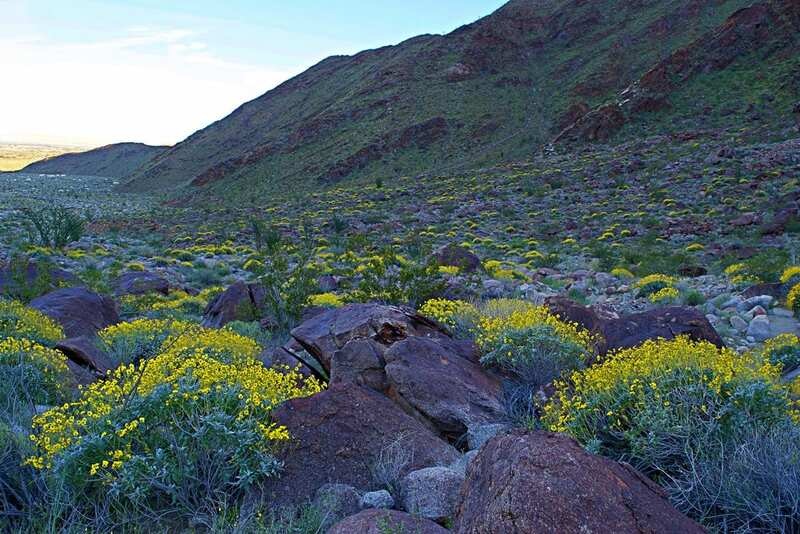 We Googled “Best Wildflower Hike in Borrego” and the google machine spit back “The Slot“. We had to go. We found a cool slot canyon that reminded us of Palm Canyon outside of Coachella. 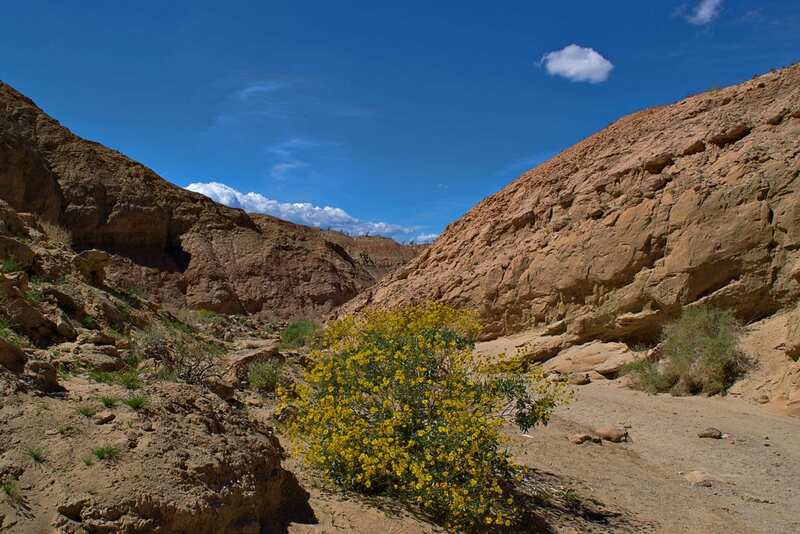 We saw some flowers during our two-mile loop through The Slot, but they were really just icing on the slot canyon cake. 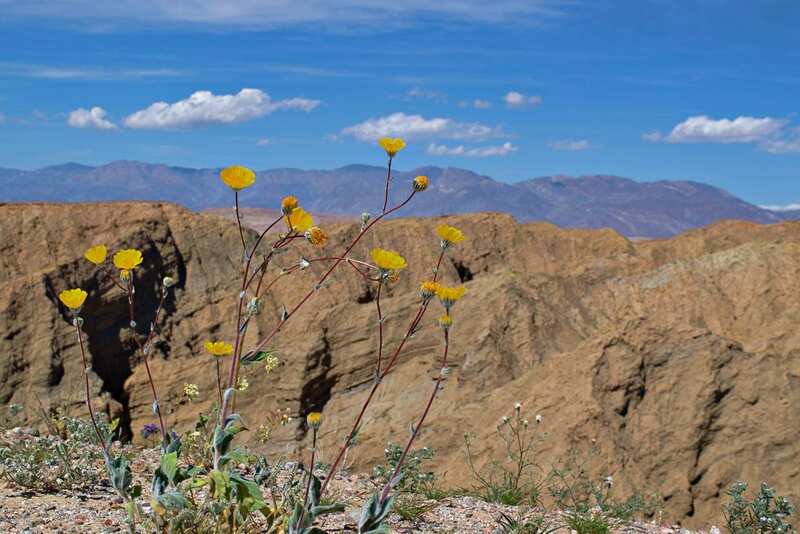 Borrego State Park had a feeling that bloomagedon was coming and boy did it come. Photographers descended on the park in mass to capture the eruption of blooms. 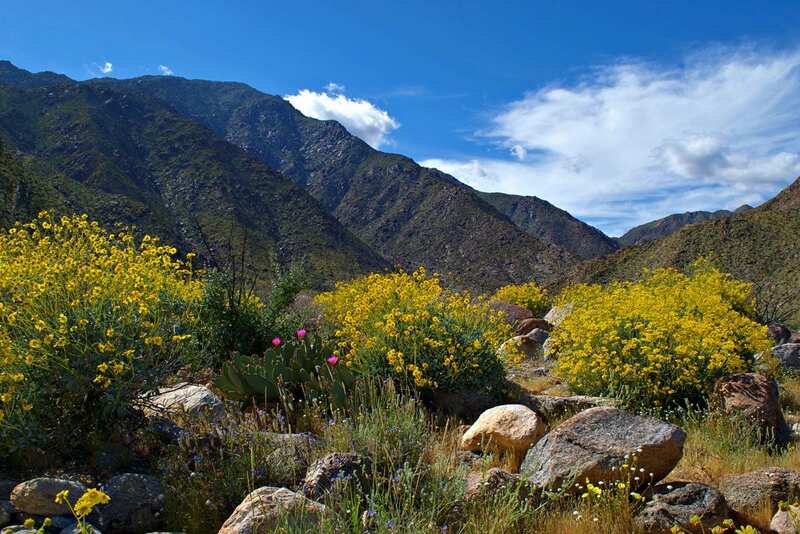 Borrego Springs is the largest state park in the contiguous US, but the flowers tend to mass at the base of the mountains alongside streams. 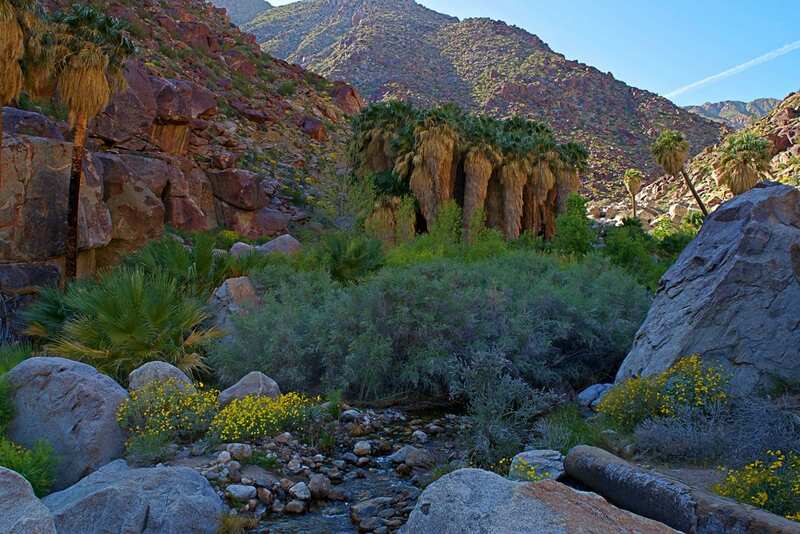 The hike up to the oasis of Palm Canyon crown jewel of the park. Water and wildflowers amped this hike up 10 fold. 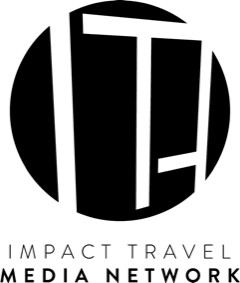 The 2.8-mile loop hike was filled to capacity when we went, so make sure you start early for this one. 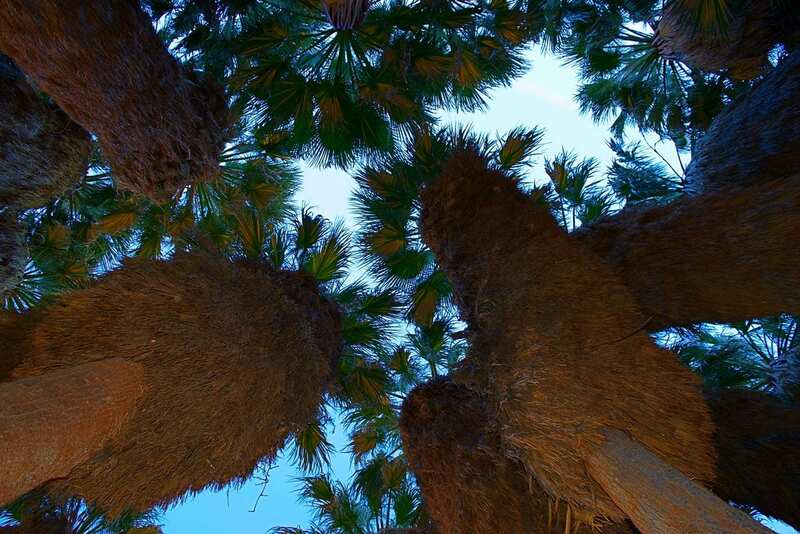 At the end of Palm Canyon is the oasis itself. 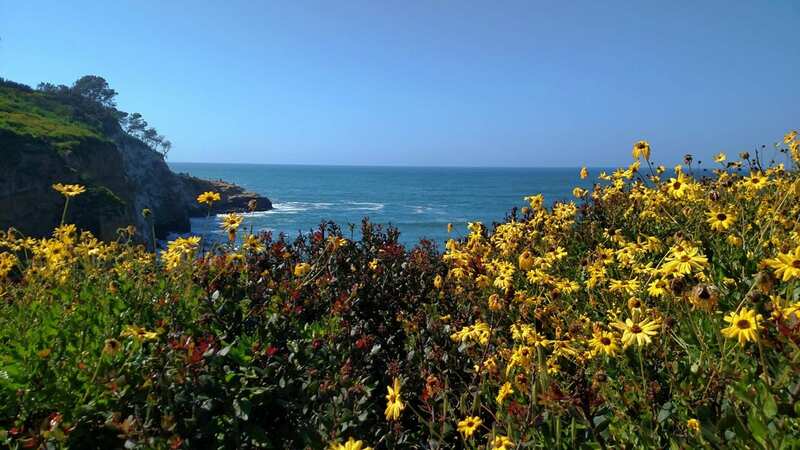 The wildflowers add that little extra punch to the water-filled wonderland. The only thing that would have made this hike better is if we saw the bighorn sheep coming down for a drink. 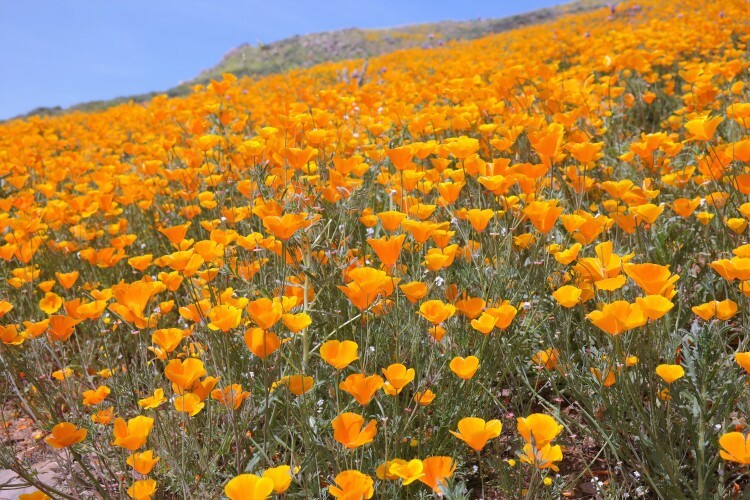 Alexander Kunz has another alternative to Borrego -“There’s another bloom in town… it may not be as spectacular as the Anza Borrego wildflower “super bloom” this year, but it’s quite a treat for the eyes nevertheless: plenty of wildflowers are in bloom right now at Torrey Pines State Natural Reserve – more than I have ever seen there! 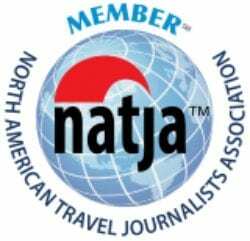 Stay on the trail – You’re shot isn’t so important that you need to trample the scene for the next guy. 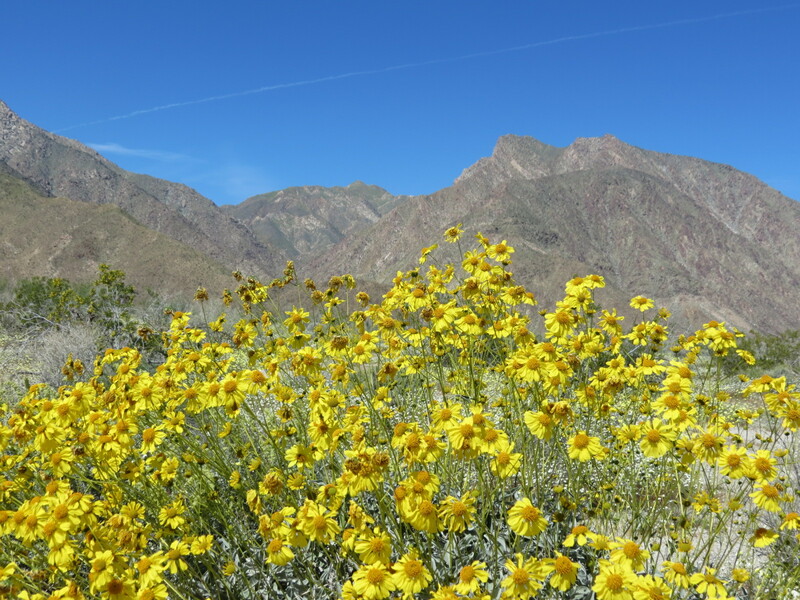 No picking flowers – This ranges from a fineable offense at Borrego Springs to simple common sense in other areas. If you pick a flower, then it isn’t there for the next photographer or to send out seeds for the upcoming season. Pack your trash out – It goes without saying, yet it still needs to be said. Park legally – Prime bloom sites get crowded on busy weekends, but that’s no excuse to park in people’s lawns or in fragile protected areas. Leave early, carpool, and look for shuttles. Keep your pets home or on a leash – It’s busy times out there. Does Fido really enjoy the flowers that much? Don’t let puppy wreck the shot for the next photographer and for the love of Pete pick up his poop. Obey all signs and posted regulations – Show the local law and Mother Nature a little respect. Just because there are flowers out doesn’t mean that it’s playtime. 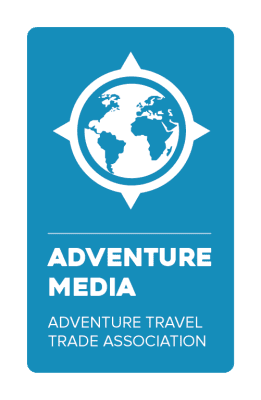 Perhaps Aliyyah Eniath said it best “Take nothing but pictures, leave nothing but footprints, kill nothing but time.” Of course, if you stay on the trail, you might not even leave footprints.